Iconographic Symbols bell; book; crutch; hermit; man with a pig at his side; pig; Saint Anthony's cross (tau-shaped) with a bell on the end. Lord God, You gave Saint Anthony the Abbott the grace of serving in the desert in prayer with You. Aided by his intercession, may we practice self-denial and hence always love You above all things. Amen. 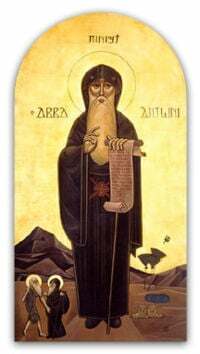 Saint Anthony the Great (251 - 356 C.E. ), also known as Saint Anthony of Egypt, Saint Anthony of the Desert, Saint Anthony the Anchorite, and The Father of All Monks, was an early Christian ascetic, later sanctified for his exemplary devotion to the lifestyle and teachings of Christ. He was an unofficial leader and spokesman of the Desert Fathers, a loosely organized group of Christian hermits who left hearth and home to take up residence in the harsh Eyptian desert as a form of imitatio Christi. Though no surviving texts are unequivocally attributed to him, Anthony's life is recounted in considerable hagiographic detail in Bishop Athanasius's Vita Antonii - the source of many tales of his spirtual strivings and the means by which the remainder of the Christian polity came to know of this retiring Egyptian "monk." His feast day is celebrated on January 17 in some churches, but celebrated on Tobi 22 (January 30) in the Coptic Orthodox Church and the Coptic Catholic Church (both of which have the closest cultural and geographical ties to him). Though Anthony is often recognized as the "Father of Monasticism," such a title is somewhat misleading, as eremetic (solitary, often desert-dwelling) Christian, Jewish and pagan forms of monasticism were already being practiced throughout the known world. For example, the Hellenized Jewish philosopher Philo of Alexandria (20 B.C.E. - 40 C.E.) described such individuals in his De vita contemplativa (“On the Contemplative Life”), where he notes that their individual dwellings (and loosely-organized communal organizations) were long established in the harsh environments surrounding Lake Mareotis (close to Alexandria) and in other less-accessible regions. His account is notable for addressing both the actualities of their renunciation and also the motivations that could underlie such a difficult spiritual path. The renunciants were praised for their singularity of purpose, as they "always retain an imperishable recollection of God, so that not even in their dreams is any other object ever presented to their eyes except the beauty of the divine virtues and of the divine powers." Long before [Anthony's time] it had been usual for Christians to practice asceticism, abstain from marriage and exercising themselves in self-denial, fasting, prayer, and works of piety; but this they had done in the midst of their families, and without leaving house or home. Later in Egypt, such ascetics lived in huts, in the outskirts of the towns and villages, and this was the common practice about 270." However, Anthony's contribution, as discussed below, was as an exemplar whose exploits were publicized far beyond his desert region, making his mode of monasticism known throughout the Christian world. He was one of the first to take renunciation to the desert, denying the supports of home and community relied upon by the vast majority of his predecessors. Most of what we know about the life of Anthony is derived from the Greek vita (“Life of Antony”) by Athanasius (d. 373), a text that was highly influential throughout the Eastern Christian world. Following its composition, it was soon translated into Latin, which allowed its influence to be extended throughout the Western half of the Holy Roman Empire. Other information on his life comes from a limited selection of surviving homilies and epistles. However, their attribution to Saint Anthony has been roundly questioned. In the year 251 C.E., Anthony was born into an upper class Christian family near Heraclea, in Upper Egypt. He had an unremarkable childhood and adolescence, which was abruptly shattered in 271 with the death of his parents, who left him with the care of his unmarried sister. He subsequently attended mass and was transfixed by the Gospel's depiction of the Christian path of renunciation: "If you want to be perfect, go, sell what you have and give to the poor, and you will have treasures in heaven; and come, follow Me" (Matthew 19:21). Taking these teachings to heart, Anthony decided that he too wanted to embark on this path of devoted practice. 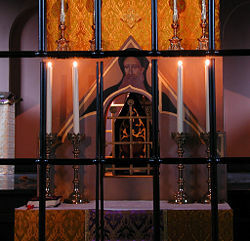 So, he gave his wealth to the poor and needy and placed his sister with a group of Christian virgins (a proto-nunnery), freeing himself from personal and financial obligations, which, in turn, allowed him to devote his entire energy to the path of renunciation that had so captivated him. Anthony's anchoritic (from the Greek: "to withdraw") lifestyle was remarkably harsher than that practiced by his ascetic predecessors, as he was one of the first to attempt living in the desert proper, completely cut off from civilization. Specifically, he chose to head directly into the arid alkali-plains region called the Nitra (in Latin) (Wadi al-Natrun today), about 95 kilometers west of Alexandria, some of the most rugged terrain of the Western Desert. His flight from society was motivated by a desire to imitate Christ's forty-day sojourn in the desert. During this time, the Vita (written by Saint Athanasius) describes the contest between Saint Anthony and the Devil, who "afflicted him with boredom, laziness, and the phantoms of women." It was only through a drawn-out battle and a steadfast reliance on the power of prayer that Anthony was able to emerge unscathed. After these trials, he sealed himself into a tomb, relying on some local villagers to provide him with food and water. Again, the Athanasian account states that the monk was confronted by the Devil, who physically assaulted him and left him for dead. When his patrons from the local village came to visit, bringing their gifts of bread and water, they were shocked by the dire straits that the holy man was in. So, they quickly crafted a litter and carried him out of the desert to a local church. When confronted with his unflappable faith, the demons were said to have vanished. While sealed in the fort, Anthony only communicated with the outside world through a crevice just large enough to accept the food brought to him by pilgrims. Though he never saw these supplicants, his words of support and consolation, plus his reputation as a spiritual adept, gradually drew a crowd of devotees, who (over his twenty years of seclusion) formed a makeshift community around the abandoned fortress. Antony gave so little heed to the command that he washed his garment, and stood all next day on a raised place before them, and appeared in his best before the governor. Therefore when all the rest wondered at this, and the governor saw and passed by with his array, he stood fearlessly, shewing the readiness of us Christians. For, as I said before, he prayed himself to be a martyr, wherefore he seemed as one grieved that he had not borne his witness. But the Lord was keeping him for our profit and that of others, that he should become a teacher to many of the discipline which he had learned from the Scriptures. For many only beholding his manner of life were eager to be imitators of his ways. So he again ministered as usual to the confessors, and as though he were their fellow captive he laboured in his ministry. After the Maximinian persecution ceased, Anthony returned to his desert fortress to resume his ascetic devotions. While he willingly addressed the renunciants who had gathered, he was plagued by a sense that he was letting his own spiritual discipline atrophy. As a result, he departed from his followers and traveled deeper into the Eastern Desert of Egypt. After three days of travel, he found a spring of water and some palm trees, where he chose to settle. He described this location as his "inner monastery." However, Anthony did not allow his personal spiritual quest to overrule that of his fellow seekers, so, on occasion, he would return to his previous dwelling (in the abandoned fort) to offer them instruction. After years of steadfast worship and instruction, Anthony realized that the end of his life was nearing. So, he summoned his most devoted followers around him—including his successor Marcarius—divided up his meager possessions among them, and described his funeral requests to them. Specifically, he asked that they place his body in an unmarked grave in the middle of the desert, so that it would not become an object of veneration. After making his preparations and uttering a brief prayer, he died. It is thought that he had lived for 105 years. Though he spoke only his native language, Coptic, Anthony's sayings were primarily promulgated in Greek translations and in the Athansian Life of Saint Anthony the Great. This document, which was read throughout the Christian community, also popularized the legendary accounts of the ascetic's life. Finally, many sayings attributed to him (and stories told about him) are found in various collections of sayings of the Desert Fathers. Due to their awe-inspiring and often fantastic nature, the stories included in Anthony's hagiography have become source material for various artistic ventures, both historical and modern. In the sphere of letters, esteemed French novelist Gustav Flaubert considered his La Tentation de Saint Antoine to be his most significant literary work. More significantly, visual artists, such as Hieronymus Bosch, Mathias Grünewald, Martin Schongauer, and Salvador Dalí, have all depicted incidents from the life of Anthony. Indeed, such images (especially surrounding Anthony's temptations) have been common subject matter for European visual art since the tenth century. The Roman Catholic and Eastern Rite Christian sects laud Anthony as the founder of Christian monasticism. Though he himself credited the legendary Saint Paul the Hermit as a predecessor, Anthony was one of the first Christians to take to the desert in a conscious attempt to imitate the life and sufferings of Christ. Though this lifestyle was extant in Egypt and surrounding areas before his time, Anthony can be credited for his role as an exemplar—motivating others to adopt this lifestyle through his teachings and biography (particularly as recorded in the Vita written by Saint Athanasius). Though he did not organize a monastic community (which occurred 50 years later at the hand of Saint Pachomius), a community of like-minded believers sprung up around him organically. The development of organized monasticism can be seen as a natural outgrowth of this, especially for those who wished to follow him, but needed the company of others to survive the harsh conditions. And [the Lord] gave grace to Antony in speaking, so that he consoled many that were sorrowful, and set those at variance at one, exhorting all to prefer the love of Christ before all that is in the world. And while he exhorted and advised them to remember the good things to come, and the loving-kindness of God towards us, 'Who spared not His own Son, but delivered Him up for us all ,' he persuaded many to embrace the solitary life. And thus it happened in the end that cells arose even in the mountains, and the desert was colonised by monks, who came forth from their own people, and enrolled themselves for the citizenship in the heavens. The most enduring physical remnant of Anthony's life and mission can be found at an oasis in the Red Sea Mountains, 155 kilometers (100 miles) south east of Cairo: the fortress-like Coptic Monastery of St Anthony the Great. This structure, the oldest Christian monastery in the world, was founded in the middle of the fourth century on Anthony's burial site. It recently received international news coverage when a monk (working with the Egyptian Supreme Council of Antiquities) discovered an entire eighth century church buried beneath the existing structure, and, beneath that, preserved cloisters dating back to the fourth century—the oldest ever unearthed. ↑ Note: The term "monk" is used in quotation marks because the idea of Christian monasticism was yet inchoate at this early period in the tradition's history. Indeed, Anthony was, in this way, a spiritual innovator who was responsible for the notion of a Christian life entirely dedicated to religious faith and observance. However, it was not until the time of Saint Pachomius that these ideas became formalized into a tradition proper. ↑ From "The Contemplative Life or Suppliants" in The Works of Philo, translated by C. D. Yonge, (London: H. G. Bohn, 1854-1890), sections II (18-20) and III (25-27). Accessed online at: http://www.earlychristianwritings.com/yonge/book34.html. ↑ E. C. Butler, "St. Anthony" in The Catholic Encyclopedia. Accessed online at http://www.newadvent.org/cathen/01553d.htm. ↑ Though such difficulties and ambiguities are frustrating for the modern historical scholar, it must be noted that the authors of these hagiographic sources had a far different motives for memorializing their religious "heroes." Often, these accounts were the only means whereby the saint's message or example would ever be known outside of their particular localities. In this way, writing hagiography was both a means of conveying that exemplarity for popular consumption and also of demonstrating their own commitment to the ideals and the person of the sainted individual being thus described. As such, though historical accuracy is sometimes questioned, the spiritual validity and utility of such texts cannot be. See Derek Kruger, "Writing as Devotion: Hagiographical Composition and the Cult of the Saints in Theodoret of Cyrrhus and Cyril of Scythopolis." Church History 66: 4 (Dec. 1997): 707-719. ↑ From the Coptic Life of Anthony, accessed online at: http://www.copticchurch.org/StAnthonyGreat.htm. ↑ E.C. Butler, "Saint Anthony," Catholic Encyclopedia, 1907. ↑ International Herald Tribune, 2005. The Greek Vita of Athanasius. Edited by G. J. M. Bartelink ('Vie d'Antoine'). Paris, 2000. Sources Chretiennes 400. The almost contemporary Latin translation: in Heribert Rosweyd, Vitae Patrum (Migne, Patrologia Latina. lxxiii.). New critical edition and study of this Latin translation: P. H. E. Bertrand, Die Evagriusübersetzung der Vita Antonii: Rezeption - Überlieferung - Edition. Unter besonderer Berücksichtigung der Vitas Patrum-Tradition. Utrecht, 2005 (dissertation). Freely available here. An English translation: St. Athanasius. Vita Antony from "Athanasius: Select Works and Letters." Nicene and Post-Nicene Fathers Series II, Volume IV. Edited by Philip Schaff and Henry Wace. New York: The Christian Literature Publishing Co., 1890. Full text available online through Fordham University's Medieval Sourcebook. This account features criticisms for and against the attribution of this vita to Athanasius. Accounts of Saint Anthony are given by Cardinal Newman ("Church of the Fathers" in Historical Sketches) and Alban Butler, Lives of the Saints (under Jan. 17). Butler, E. C. Lausiac History of Palladius. 1898, 1904. The W.K.L. Clarke Translation (London: SPCK, and New York: Macmillan, both 1918) is available online at Fordham University’s Medieval Sourcebook. Butler, E. C. "St. Anthony the Great." Catholic Encyclopedia, 1908. Kruger, Derek. "Writing as Devotion: Hagiographical Composition and the Cult of the Saints in Theodoret of Cyrrhus and Cyril of Scythopolis." Church History 66: 4 (Dec. 1997): 707-719. Rubenson, S. The Letters of St. Antony: Monasticism and the Making of a Saint. Minneapolis, MN: Augsburg Fortress Publishers, 1995. "Discourse on Demons", translated by Rev. H. Ellershaw. "Letter To Theodore", translated by Rev. Daniel and Esmeralda Jennings. This page was last modified on 5 August 2015, at 20:30.